Join us in Mexborough for the opening night of the 2018 Ted Hughes Poetry Festival as we kick things off in style! Her debut album Fetish Bones was released on Don Giovanni records to critical acclaim. Fetish Bones was named 3rd best album of the year by The Wire Magazine, number 1 by Jazz Right Now and has appeared on numerous end of the year list from Pitchfork, Noisy, Rolling Stone, and Spin Magazine. Moor Mother was named by Rolling Stone as one of the 10 artists to watch in 2016 and named Bandcamp's 2016 artist of the year. Moor Mother released a 2nd LP called the Motionless Present commissioned by CTM X VINYL FACTORY 2017. Moor Mother has appeared in the Quietus, Interview Magazine, The Guardian, Crack, Pitchfork and others. 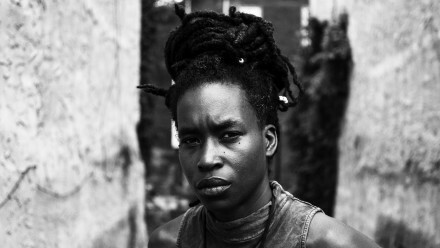 Moor Mother's schedule has included Berhaign, Borealis, CTM Festival, Le Guess Who, Unsound, Flow and Donau Festival, Rewire, Boiler Room and MOMA PS1.